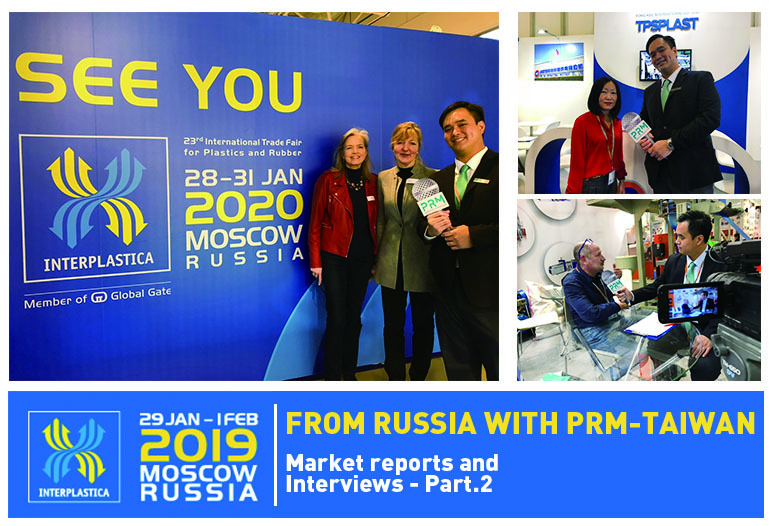 Issue148: PRM-Taiwan is here to start 2019 with a BAM! The new edition of PLASTIMAGEN® MÉXICO, organized by Tarsus México, will showcase all trends and new technologies from the plastic industry worldwide. 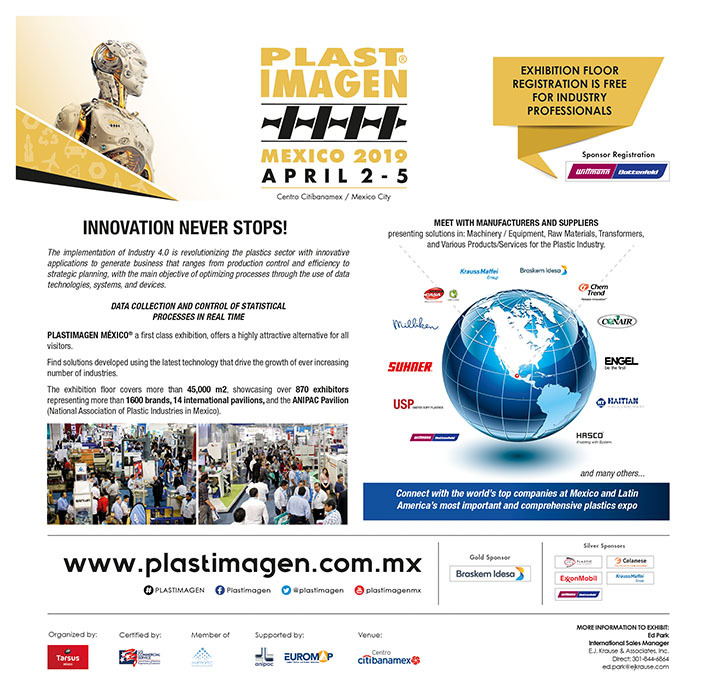 PLASTIMAGEN® MÉXICO 2019 will display over 870 companies representing approximately 1,600 brands from more than 27 countries, 14 International Pavilions, and the ANIPAC Pavilion (the National Association of Plastic Industries in Mexico). With more than 45,000 m2 of exhibition space, PLASTIMAGEN® MÉXICO is the most complete and foremost plastics expo in Latin America; an event designed to meet the needs of more than 30,000 visitors who are seeking innovative solutions for their companies. In its 22nd edition, PLASTIMAGEN® MÉXICO is Latin America’s plastics sector’s most important business center for closing deals, networking, exchange of ideas, technical training, research for innovations, products, solutions, and much more; displaying the latest in technology/machinery, and exhibiting products and services that are aimed to more industries. This event will also feature a unique International Conference Program organized jointly by the National Association of Plastic Industries (ANIPAC) and Tarsus México, which will offer visitors an excellent option to train and find solutions to problems that arise in any link in the chain of the plastic industry. In this edition, a new sector is highlighted that corresponds to Circular Economy on the ground floor of the site. For this and many other reasons, PLASTIMAGEN® MÉXICO 2019 is considered the most important exhibition of the plastics industry in Mexico and Latin America. Across the globe, the plastic industry generates sales for more than $ 22 billion a year and its market value is $ 33 billion. If we talk about Mexico only, the plastics industry is booming. In 2017, production increased by 7.7% annual growth and by the end of this year more than 6% is expected. Mexico imports 20 billion dollars of resins and plastics a year and it is one of the main countries in the worlds to export products along with the United States and Canada. This is due to the increase use of plastic as a raw material in many industries as they see that is becoming more useful and has a lot of potential. Many companies have become more competitive by evaluating the option of replacing parts of traditional manufacture for those with plastic in industries such as: automotive, medical devices, construction, packaging, agricultural and household appliances, among many others. Mexico is located in the 12th place in the consumption of plastic, so it is very easy to make the decision to come and visit PLASTIMAGEN® MÉXICO 2019, where companies from all over the world will be showing their latest technology and top of the range machinery and technology to Mexican and Latin American professionals in this sector and many others. PRM will participate to this exhibition, and we sincerely hope to meet you there. Visit www.plastimagen.com.mx for more information.